A nice day in Piazza Duomo, full of tourists, life and culture. Clear skies over Piazza Duomo, a perfect day to visit the rooftop terrace or do walking tour. Don’t forget the Duomo museum as well. The Duomo is the third largest cathedral in the world after St. Peter’s in Rome and the Cathedral of Seville. It took over 500 years to complete and today is constantly being repaired and maintained. Cathedral The Duomo is the third largest cathedral in the world after St. Peter’s in Rome and the Cathedral of Seville. Looking at a map of Milan, you can see that Milan’s city streets follow a spider web pattern with the Duomo being the center point. Across from the Galleria and Cathedral is Museo del Novecento 900 Contemporary art from 1900 on. A collection of significant donations by both artists and citizens, who left their art collections to the Civic Museums. Get a Milano Card for discounts, free entrances and transportation. For 13 euro you have discounts in restaurants, shops, ticket venues, transportation and lots more. 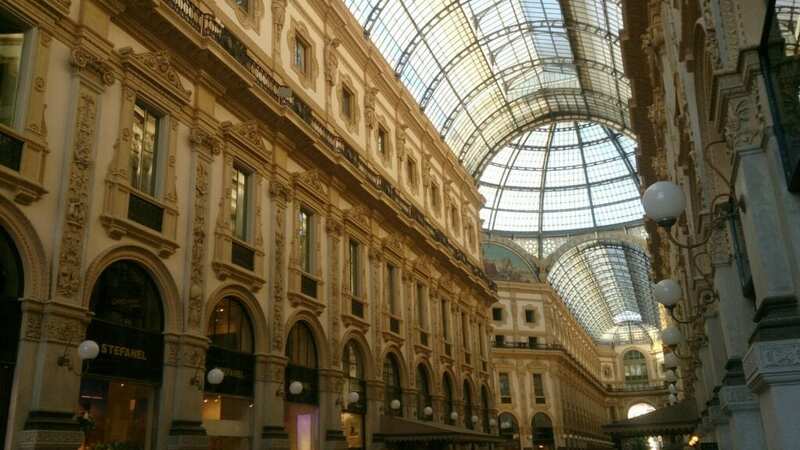 The Galleria Vittorio Emanuele is at the heart of Milan and is a must see for all tourists. Not only is it one of the oldest glass covered galleries in Europe, but it is also a central meeting point and luxury shopping gallery. Inside you will find luxury boutiques such as the original Prada store, Gucci, Louis Vuitton, as well as luxury hotels. Do a Private, half day shopping tour of Milan have a local expert guide you to the best deals. The most luxurious hotels are here in the gallery, the Hotel TownHouse 8 and Park Hyatt Milan.